I think it is possible. We see by the advancement of the world and our own advancement, according to the discernments that we have accumulated, that we are operating correctly and that there is no other choice. We were given a rare opportunity; a special treatment from Above and comfortable conditions that actually support what we are doing. We don’t have to run forward with our eyes closed. Day by day we realize that this is the right way. We see how the whole world is drawn into this process and how necessary it is for us, to the world, and to the Creator. Finally there is a concentration of right decisions, which is a result of all the years the actions we have performed, of many states, discernments, and impressions we have experienced every moment, everywhere, and by each and every one of us. We have to bring all our experience and the discernments that each of us has accumulated during this time together and to concentrate them into one sharp desire. Then in response to this desire that is yearning for its correction, for the attribute of bestowal, we will be able to receive the upper Light that will influence us and raise us to the first spiritual level. Question: How can we know that our actions are in favor of the Creator? Answer: If the Creator is a certain form that I put together inside me, then I have to know what is in His favor and what is not. If the form I am putting together is a total form of bestowal, then it is in its favor to bestow. The Creator is inside me. A person doesn’t know anything about what is outside him; the world that seems to surround me is an illusion. It is a lie that was created so that by my attitude towards it, as if towards an external world, I will be able to learn it in greater details, by bringing things out of myself. If I could take out my feelings and my thoughts and see that I spread all over the world, then it would be the world of Ein Sof (Infinity). Then I would discover that our world doesn’t exist, that it is all parts of my vessels. In fact, there is nothing, not all the images and people around me. All this is me, called “Adam” (man) who is standing before the Creator’s force. Now I don’t see Him, but I was given a chance to start feeling Him. We will never be able to know about anything outside ourselves since everything is only “from Your actions we shall know You,” and in order to do that we have to acquire spiritual attributes by ourselves. It is in that the spiritual world is different from the corporeal world. 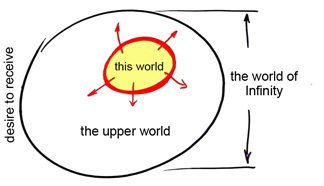 There is also a region that I feel as “this world,” and then I begin to feel bad in it, as if it is crowded and too narrow in this circle. I begin to search; perhaps there is something outside it. Some of my senses tell me that there is something beyond my boundaries because this part of my senses is concealed: I feel that I live in them and die. There are also different discernments in me: still nature, the vegetative, the animate, and the “speaking,” which I also feel as “this world.” They also appear and disappear, are born and die. I see their life and death, and by that I begin to think that everything is temporary and expendable; everything changes and then I feel a kind of emptiness. So I begin to search and to investigate what is beyond the bounds of this corporeal life. If I don’t break out of my boundaries, how will I be able to discover what happens there? This is how we enter the upper world that is beyond the bounds of this world, but both this world and the upper world are all a desire to receive, and if we unite them, the outcome is the world of Ein Sof. “The research showed that openness, positivity, assurances, shared tasks and a shared social network are strategies that couples can use to make their relationship better. “To ‘open up’ your relationship, we encourage not only talking about your feelings, but getting your partner to talk about what she is feeling as well. Positivity entailed being a ‘fun’ person and acting upbeat and cheerful as you interact with each other. “It’s also important to assure your partner that you’re in the relationship for the long haul, to divide household chores and responsibilities equally, and to make an effort to include your partner’s friends and family in some of your activities. “The study showed that a person who practices one of these five strategies is likely to practice the others as well. And a partner who notices that one of the strategies is being used is apt to be tuned in to their partner’s efforts in the other four areas. “Persons who use any of these maintenance strategies will not only be more satisfied with and committed to their relationship, they are also likely to continue to love and, yes, even like each other throughout its duration. My Comment: An environment determines the future of everyone and every couple. Regular talks, discussions, and family workshops are the key to understanding and inclusion into each other and this is a guarantee of the life of a couple as a whole. Our advancement in the last 2,000 years of exile was of a different character. The nation of Israel gradually lost the spiritual level of Galgalta ve Eynaim (GE) that they had, became more and more mixed with the “nations of the world,” and descended to the corporeal level. In Kabbalah this process is called the “descent of generations.” We talk about descending along the steps of our world from the state in which there is still a certain illumination from spirituality, until the very bottom where it is dark. These are the laws of nature: Everything depends on the relation between the upper Light and the Reshimot (spiritual genes) below. Today when the descent has ended and the ascension is before us, we then determine these relations when we change the coefficient in the set formula; in other words, when we insert the connecting link, the measure of the equivalence of form, between the Reshimot and the Light. During exile, we could not do this; thus everything happened in its time. It is not by chance that the Kabbalists knew and wrote about the time when this period would need to end. The Reshimot descended lower and lower, deeper and deeper within the egoistic desire, and it became “coarser” to the extent of “burdening of the heart”. However, today the descent is over, and we see that according to the surrounding world: All the areas of life are on the brink of bankruptcy. Family, education, culture, finance, business, and even religion‑everything today is penetrated with unrestrained and acute egoism. Thus, we went through 2,000 years of very hard work. The world advanced and Israel descended from its spiritual degree, and here, when the world is collapsing under the blows of the crisis, they stand “face to face.” The correct connection, the correct combination between the “nations of the world” and Israel has been created. And now it is possible to begin the ascent. The present state is desirable and highly productive. Question: It says: “I awaken the dawn and it isn’t the dawn that awakens me.” Is there a certain sequence of internal events that allow me to awaken the dawn as quickly as possible without any delays and to establish the connection with the group and with the Creator? Answer: We can only hasten time and the desire to become Adam (human). According to scientific data, the universe is 15 billion years old. Humankind has developed for hundreds of thousands of years, and it is only in the last 30,000 years that we have begun to approach the true level of Adam. This evolutionary process takes time. In spirituality it is different. In spirituality you know and feel how many discernments you have been through, how the world has advanced and what people have learned by approaching spirituality. There were long periods of “delays” in history. The last exile lasted for 2000 years, and the great sorrow is that the process seemed to be halted from Above. People suffered simply because there were not allowed to advance towards the goal, they burned and yearned for it, but there was only darkness in response. Now, however, the opposite is true: I am given everything from Above, even more than I can absorb, but the trouble is that I don’t need it; I actually want other things and suffer because I don’t have them. There are many hours of powerlessness ahead. In such case, I for example, begin to work on articles by Baal HaSulam and Rabash. It is a kind of “hobby.” I correct them, delete commas, change words and phrases, and put them in a simpler language, etc. By this mechanical work we try to get back on track. It is because in the current descent we have nothing internal left, and we can only make external efforts. We need mutual guarantee, support from the friends, and a rigid schedule is necessary. In any case, the exit from the descent depends on our efforts. Therefore it says that Israel hasten time. The Light comes from Above, of course, but we awaken it. On the whole, we are advancing at an extraordinary speed these days, and I really have great hopes regarding the Arava convention that will be held this weekend. You will see. It will be much more qualitative than the previous conventions and we will feel discernments that we can organize and compare with each other. An inclination, tension, readiness and the ability to stay “fit” and navigate ourselves internally is building up in each of us, as if we are holding a steering wheel in our hands. A person actually has to feel, to discover this “steering wheel” inside him: The road is opening before us and internally a person constantly stabilizes himself on the road and stays off the shoulders of the road. The one problem in every state is that in this world we cannot connect two opposites into one. Modern quantum physics also deals with the fact that light is both a wave and particle. Although a wave and a particle are not perfect opposites, physicists cannot understand how they can be integrated into one phenomenon. They cannot see a phenomenon yet in which two total opposites connect simultaneously, as it happens in the spiritual world, but they already see the beginning of this phenomenon. A person who studies Kabbalah faces a similar problem, not on the level of the still nature, not like in physics, but rather on the level of thoughts, intentions, and feelings—on the fourth level compared to the first level of the still nature. The first levels are the still nature, the vegetative, and the animate, and only afterward is there the human level that determines what’s in a person’s mind and heart, the feelings thoughts, the power and the insight. In the meantime there is no dualism in that, the dualism is in the fact that on one hand I have to bestow upon the whole world and to worry that I will be able to bestow upon everyone. On the other hand, I have to understand that I am doing all this for myself and that this world doesn’t need that. All the corruptions that I see in it only show me where I have to work, and they were made especially for me. There is the same contradiction here as in the story of Abraham who was told that he had to sacrifice his son Isaac, but that through him he will multiply—these are two contradictory things. This is how we should see our path: On one hand we worry about correcting everything in the external world, on the other hand, there is nothing to worry about, since all of reality is already in a state of absolute rest and is corrected. A person should be grateful to the Creator for the one moment in his life in which he was awarded some contact with the upper force. The question is how we can understand that. But if a person was in contact with the Creator for even one moment, it isn’t just any moment. After all, he could penetrate that moment and enter the upper world through it, the eternal world in which there is no time and so every moment is an eternity. So if a person can really be grateful for that one moment, he is already at the end of correction or has at least corrected his current level. This is the reason that it is hard for us to be in spiritual states and to accept them, and this is on purpose by the way. All our work is “above reason;” we have to accept the spiritual conditions as “an ox to the burden and a donkey to the load.” And although we don’t understand them, a “habit becomes a second nature,” the Light will gradually influence us and build new desires in us. Thus we will reach a state in which all the opposites will connect into one. Then through them, we will be able to enter the spiritual world. On the one hand, our ego increasingly separates us from others, since “he who is greater than his friend, his desire is even greater.” The distance between the desires remains, but we work on it so that by the intentions we will connect into one whole. It turns out that everyone is infinitely separated from the others, but in our intentions, we are in one common point and the Creator is in it. Baal HaSulam, “The Peace”: We can all plainly see that the human species must lead a social life, meaning it cannot exist and sustain itself without the help of others. Therefore, imagine an event where one retires from society to a desolate location and lives a life of misery and great pain there due to his inability to provide for his needs. That person would have no right to complain about Providence or his fate. And if that person were to do that, meaning complain and curse his bitter fate, he would only be displaying his stupidity. This is because while Providence has prepared for him a comfortable, desirable place in society, he has no justification to retire from it to a desolate place. Such a person must not be pitied, since he is going against the nature of Creation. And since he has the option to live as Providence has ordered him, he should not be pitied. That sentence is agreed upon by all of humanity without dispute. A person who retires from society will certainly suffer. This is the way we are built; we need society. It’s because no one can provide everything that he needs for his existence by himself. It’s the same with animals, and all the more so with humans. Question: But why does Baal HaSulam use such a blunt language? Answer: He wants to show that there are clear cut truths in nature: If you want to remain human, you have to live among human beings. If you want to be an animal, go and live among animals. A child who is born in a herd of cows takes an example from what he sees and becomes the same up to his physiological limits and possibly even beyond these limits. The environment determines everything, no one promises you anything. By choosing the environment you determine your own future. So choose who you want to be; which society you want to join. There is a need to be accurate here: First you decide who you want to be, and then you enter the right environment that will turn you into who you want to be. Ideally, if a person advances correctly by adding his feeling, by checking himself, by listening to his attributes, then he will always find the right place, the right environment that will advance him gently and lovingly. If you entered one of the environments “head on,” no matter which, you would find that environment very beneficial. But today you are mixing them and confusing them and you don’t know where you feel good and where you feel bad. It’s because there is no accurate discernment of any of them, only the mixed and blurry contours.